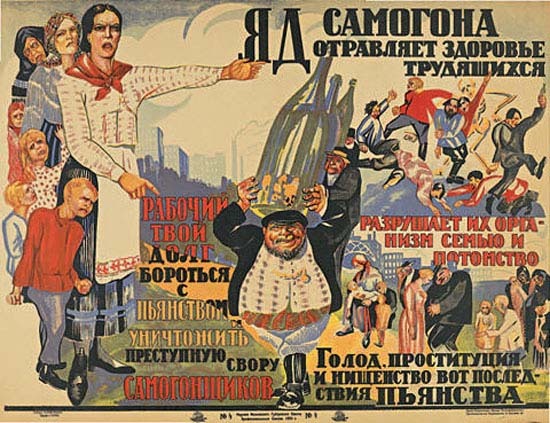 "The poison of moonshine kills the health of the workers"
There’s just so much going on in there, from the stern finger-pointing matriarch to the fist-clenching neglected child, to some Cossack dancing gone badly wrong. Then there’s this one. This is how you motivate people to change their behaviour in a command-and-control economy, I guess. I wonder if it worked? "How we eradicate drunkenness – Through school, club and village cultural houses to the victory above drunkenness. – Pioneers! Teach your parents not to drink! Teachers! Explain the damages of alcohol to children! Youth! Do sport, and you will not want to drink! Women! 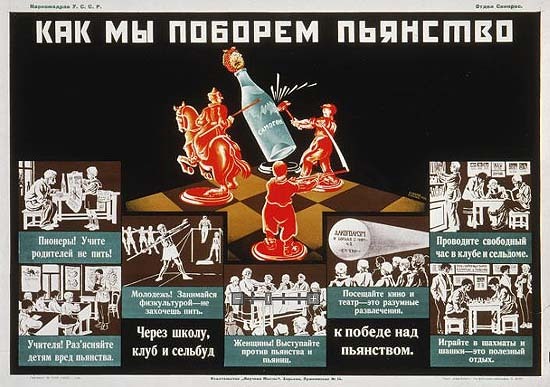 Stand up against drunkenness and drunkards! Visit cinema and theater – this is a reasonable pastime. Pass your free time in the club and village cultural house. Play chess – it’s a useful pastime." It certainly managed to produce a few chess champions but I suspect even Deep Blue has the occasional tipple. Can’t argue with the message though. This entry was posted in All Over The World, Media, Semiotics and tagged Advertising, communications, CreativeReview, international, society, Stenberg Brothers. Bookmark the permalink.